Ford is finally bringing some app love to its new plug-in hybrid vehicles. The Dearborn-based automaker this week updated its MyFord Mobile app with support for its C-MAX Energi and Fusion Energi plug-in hybrid cars. The MyFord app finds chargers. Ford’s MyFord Mobile app, which is available on both iOS and Android, was previously compatible only with the company’s Focus Electric. The app lets Focus Electric owners (and, soon, C-MAX and Fusion Energi owners) monitor the charge state of their car’s battery, precondition cabin temperature, and even earn achievements for driving efficiently. While the Focus Electric is an all-electric vehicle, the C-MAX and Fusion Energi cars are plug-in hybrids. This means that they have both an electric motor and a gasoline engine. According to Ford, both cars can get up to 21 miles of pure electric driving range per charge, and have an EPA-estimated range of 620 miles on one tank of gas and one charge. Ford is also adding more features to its app—primarily the capability to find electric vehicle (EV) charging stations. Ford has partnered with PlugShare, a company that crowd-sources EV charging station data, to bring EV charging info to MyFord Mobile. PlugShare’s data is more than just charging station locations—it also shows information for each station, such as whether it’s free (or how much it costs), what type of charger it is (120V, 240V, Tesla Supercharger, and others), and whether it’s currently in use. 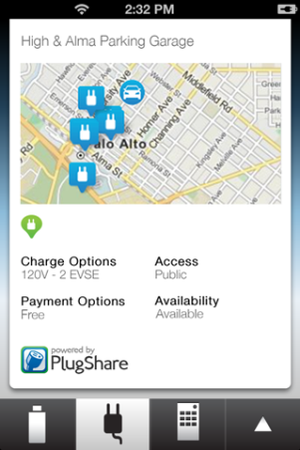 PlugShare maps charging station locations. The PlugShare data also includes photos, check-ins, and reviews, so drivers are aware of the details and environment of the station. On the MyFord Mobile app, the station finder component “blends point-of-interest search with charging station information” so that drivers can find “opportunistic charging” near their destination. In other words, drivers can search for destinations such as restaurants or shopping malls, and the MyFord Mobile app will also show nearby available charging stations. Although Plugshare’s data (PlugShare has its own app, by the way, if you’re not a Ford owner) includes people’s private garages, the MyFord Mobile app will only show public charging stations. Ford is plugging PlugShare data into both its MyFord Mobile apps and its MyFord Mobile Web portal. The updated version of the MyFord Mobile app is not yet available.